Last summer we planted some lavender (both from seed and from the flower shop) in our garden, and when the autumn came I cut off the flowers and dried them inside. And, since things to tend to take some time, in January I finally took the time to sew up some lavender-filled satchels. 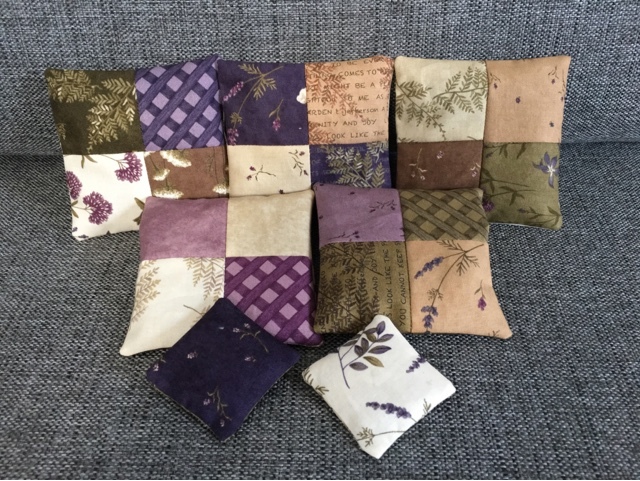 I had a mini-charmpack of fabric with a lavender/flower theme, and when I first saw it, I knew it would be a perfect match for our lavender. Two of these were given away to a college of mine, as a late Christmas-early birthday present. Little miss A was very happy the other day, when we walked to the store and bought "crocodiles" (a bag of dried fruit - with a dinosaur on the front). 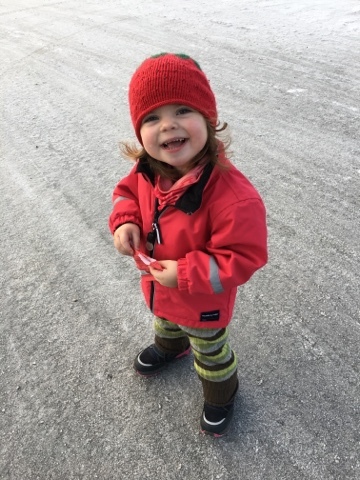 She walked all the way there and back again by herself - wearing her brother's old wooly pants (they're almost 7 years old now) and her cousin's ond strawberry knitted hat (I knitted it for E when she was 1, which is about 7 years ago too). Inheriting and reusing is a good thing when they're this small. Have a good and crafty week!